... near my raised bed. P.s. my tulipa Tarda is also finally flowering! normally it is one of the very first heralds of spring....so, I guess it must be spring now! Wow, a very radiant combo! What is the name of that plant with ball-shaped flowers, please? Thank you. Will have a look! It is very nice. Clever planting Tt. Beautiful subtle contrasts. What pretty little flowers. What are they called? Lovely combo,Terra..the Drumsticks have done really well this year,haven't they? Thanks Carole and Sandra ..
have you found that to be true ? Thanks for your thoughts, Carole and Sandra .. I hope your coloured drumsticks continue to thrive ! beautiful! lovely fresh colour combination. As usual every thing has been said by the time I get round to viewing the latest pics. Lovely colour combination. You should open your gdn to the public sometimes & charge everyone a fiver to go in! Perhaps you do? not visited for real ! Lol. these are very pretty. like the cute glow. from jane! 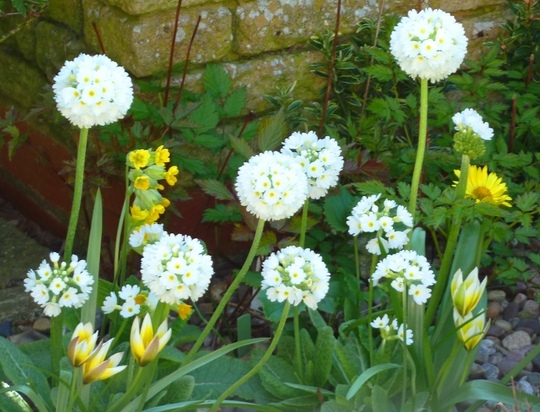 I love this plant...it is like a snowball puff, like Dandilions before you pick and blow them away:) but much prettier.